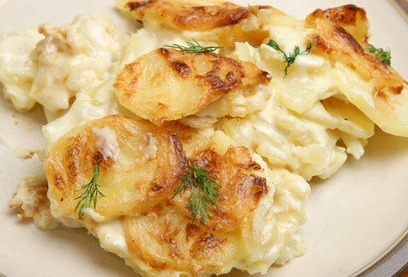 You must try this old fashioned scalloped potatoes recipe. Why? These potatoes are the perfect match for that ham in the oven. Forget the oven, you can add ham to this dish to make it more of a hearty meal. Serve with a fresh salad and homemade bread. Creamy, and perfectly seasoned, these babies are wonderful with a steak, chicken or beef. This creamy rich potato casserole is requested often. Easy to make and scrumptious. PREHEAT oven to 350 degrees and you will need a greased 9x13 inch casserole dish. In a small saucepan, melt the butter and then whisk in the flour. Let it cook for a minute and then add the milk; season with salt, garlic powder, onion powder and cayenne pepper. While whisking, bring the mixture to a slow boil. Place half of the sliced potatoes in the prepared casserole dish. Cover with half of the sauce. Salt and pepper to taste. Repeat and sprinkle the top with paprika. Note: Add some chopped ham; or serve with ham - it's delicious. You may make these potato dishes ahead of time and freeze. Just push a piece of plastic wrap onto the surface to prevent ice crystals, wrap in a plastic bag and freeze. Potatoes will lose some texture with freezing but not so much with this type of dish that you'll really notice. Don't forget to remove all the plastic. I sprinkle cheese on top of the Au Gratin potatoes when reheating. I love cheese. You don't have to use as much as I do, but why not? PREHEAT oven to 400 degrees. Butter a 9x13 casserole dish; set aside. 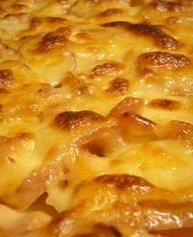 I have more than just an old fashioned scalloped potatoes recipe, check out more potato recipes below.